I don’t know if I can put into words how much I loved this book. I am certainly going to try though! It’s rare that I find a book that simply ticks all the boxes for me… And I am sure that a part of it may be timing and mood…but this book completely amazed me! First of all I absolutely loved the two main characters as well as the narrative style. We alternate points of view with each chapter between Elyse and Marshall and as we do so we slowly get to know each of them as they in turn not only get to know each other but also strive to discover exactly who they are – we’re dealing with amnesiacs here. The voices of each of these characters is completely believable. I love Elyse… She’s tough and smart, she can make hard decisions, and she can change her mind without being stubborn. She has a good heart and a surprisingly refreshing honesty for a young adult. And not once did she descend into whiny teenager mode for which I as excessively grateful! Marshall is a bit more of a complex character which we learn as he learns just who he is (and how he’s changed) He’s a very realistic mix of candor and deviousness, of hero and false hero and I think that makes his character ring all the more true. The pacing and writing style are also spot on…I sped through this book in two days and would have stayed up all night to finish it if I could have! 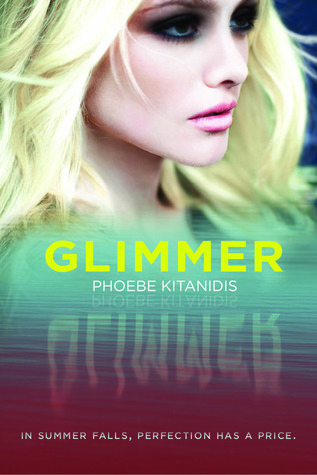 And Glimmer’s premise…it is without a doubt one of the most creative and original books that I have read in a long time. I don’t know how Phoebe Kitanidis thought up all of this but I loved it all. The sweet romantic moments, the character defining moments, the whole crazy paranormal element that is Summer Falls, the secondary characters…all amazing. Get this book, read this book, it really is THAT good. I really loved this one too! It seems like there are a lot of mixed reviews, so apparently it’s not for everyone, but I found it completely refreshing and so different from everything else out there.